(APN) ATLANTA — Gov. 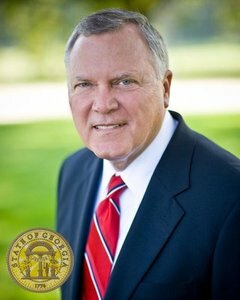 Nathan Deal made criminal justice reform one of the priorities of his administration. While he has been problematic on medical cannabis issues, Gov. Deal has pushed forward of several criminal justice reform measures that came out of the Georgia Council on Criminal Justice Reform. As reported by Atlanta Progressive News in 2012, this Council made many recommendations to ease the growing prison population in Georgia. Gov. Deal has partnered with lawmakers in the House and Senate to enact many of the Council’s recommendations. In many ways, the prison system in the United States, especially in Georgia, is dysfunctional, dangerous, inhumane, and simply does not work. Individuals with minor offenses who are incarcerated are often bullied, abused, raped, and traumatized, and leave prison worse off than when they entered. The Draconian “get tough on crime” laws that overcriminalized, helped create the U.S. as the most incarcerated place on Earth. Georgia has the fourth highest incarceration rate in the nation. In Georgia, one in every thirteen people are under correctional control. State spending on corrections has soared to more than one billion annually but recidivism rates remain high. All of that is slowly changing, with Gov. Nathan Deal’s five year Criminal Justice Reform Plan. “We must do a better job rehabilitating lives. We know that drug addiction is the root cause of much crime. Our entire society benefits if we can turn these tax burdens in to taxpayers,” Gov. Deal said in 2011. His office did not respond to several requests for comment in recent weeks from Atlanta Progressive News. In 2012, criminal justice reform in Georgia focused on adult sentencing reform. In 2013, the reform effort focused on juvenile justice reform. In 2014 and 2015, the effort focused on reentry and the fourth years misdemeanor probation reform. Several bills have already passed the General Assembly and signed into law by the Governor, with more reforms to come. In 2012, HB 1176 enacted several changes that were proposed by the Council: prioritizing prison beds for violent career criminals; and expanding probation, drug and mental health courts, and other sentencing alternatives for those convicted of less serious crimes. In 2013, HB 242 enacted several changes to reduce juvenile offending and control costs by diverting more lower-level offenders into evidence-based community programs. Sara Totonchi, Executive Director, Southern Center for Human Rights recently updated folks on new reforms affecting probation and parole found in SB 367 at Central United Methodist Church. In the most recent Session, SB 367, sponsored by State Sen. John Kennedy (R-Macon), passed the Senate unanimously and the House by 166 to one, with Sen. Greg Morris (R-Vidalia) the only dissenting vote. SB 367 restores Georgia’s First Offender Act, also known as the “Second Chance Law” of 1960, which allows some people charged with a first time offense to avoid a conviction and a public record if they successfully complete their sentence. It will retroactively reinstate driver’s licenses revoked for a drug offense. The new law allows a flat rate fine and allows the court to waive or reduce fees for indigent individuals.. Notably, the bill also lifts the ban on eligibility for food stamps (Supplemental Nutrition Assistance Program) in Georgia, for those coming out of prison for drug convictions. Moreover, the bill is reforming the school-to-prison pipeline by requiring local boards of education to develop systems of progressive discipline, and to resolve student discipline problems before referring children to court. SB 367 states that children thirteen and younger should not be detained unless the child at issue has committed a serious delinquent act. In 2015, 450 children thirteen and younger were detained. Research shows that throwing small children into detention leads to increased recidivism and more serious criminal activity. The bill improves Georgia’s misdemeanor probation system by requiring a hearing before a person can be arrested because they cannot afford to pay fines or fees. It allows courts to waive fines and fees in financial hardship and/or consider alternatives to incarceration in failure to pay cases. It removes Judges and Prosecutors from contracting for probation supervision services. SB 367 allows for parole eligibility, after six years, to an additional group of people who are serving long sentences for nonviolent drug offenses as a recidivist. Gov. Deal is expected to sign SB 367 before May 03, 2016.